MITIE Construction is directed by co-owner Paul Carter, a widely respected registered builder with more than 30 years experience in medium to large commercial, industrial and multi-unit residential construction. The other person at the helm of Mitie Construction is Steve Temple, co-owner (Construction Manager). Paul Carter originally established Mitie Construction in 2004. In 2009, Paul accelerated the company’s profile, resulting in an increased open book and the business flourished over the subsequent years. 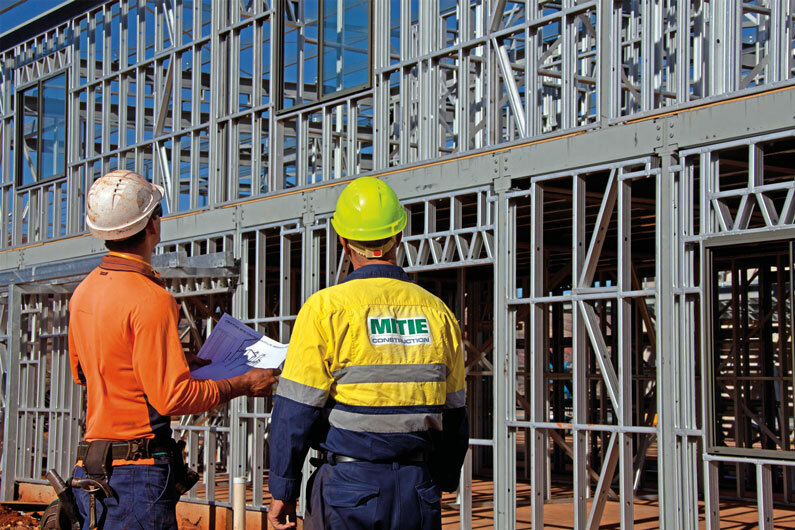 Being exposed to the public, private and Government sectors, Mitie have been able to form positive long term relationships with ancillary services including Fortescue Metals Group (FMG) and The Housing Authority. Mitie has considerable knowledge in the construction of steel framed, tilt-up panel, brick and timber buildings in cyclonic environments and use this knowledge to assist with government departments, architects and all other stakeholders in the effective design and construction of buildings. A major advantage for clients in developing a relationship with Mitie Construction is the responsiveness of the Mitie Team, to manage every aspect of the company’s operation and client relationships. Once an agreement has been reached with a client, Mitie will immediately commence work on the project thereby providing fast turn-key times. At every stage of the process, the Mitie team are there to ensure the highest levels of performance aimed at client satisfaction. Mitie understands the importance of developing close relationships with clients and to completely understand the client’s objectives, preferences and expectations. Therefore, Mitie have learned that each client and project requires individual and personal care to create the best outcome. Personal attention is maintained throughout the construction, with the director hands on from start to finish, working closely with both the team and the client. Mitie Construction are proud supporters of Telethon and the Nameless Jarndunmunha Festival in Tom Price. MITIE’s Mission is to go the extra mile and add worth to every client’s construction experience. To ultimately provide Excellence, Value and Reliability in all aspects of the client/builder activities and therefore, providing the client with the best possible development experience. MITIE’s Vision is to establish a close relationship with clients and maintain a high level of satisfaction, to enable repeat business in the future. MITIE’s Philosophy is that well designed buildings produce higher levels of operational effectiveness and that when combined with a high standard of quality and aesthetic appeal, always produce superior financial returns for developers and owners. Mitie understands the immediate commercial viability required for commercial and industrial projects. Consequently, the Mitie commitment is to produce buildings that are functional, cost efficient, practical to build and visually appealing. The life expectancy of the building and its on-going maintenance are also given careful consideration to ensure maximum capital growth on the property. Having over 50 years experience between them, both directors are registered builders in their own rights, therefore ensuring you have the best advise and capabilities to ensure a smooth construction period and a quality project. Paul is responsible for the running of this multi faceted Company. This fledgling company brings together an unparalleled wealth of experience in all disciplines of construction with an exceptionally strong background in regional and remote area construction. Paul Carter’s construction management experience commenced in the United Kingdom in 1982 where he obtained a Diploma and Certificates with the Chartered Institute of Builders (UK) for Management in Construction. By 1991 he was working on large structural refurbishments of banks, hotels and offices, while managing the construction of new Libraries, offices, colleges (Tafes), and the high profile Royal London Helicopter Landing Pad. Responsibilities included the preparation of contract programmes, establishment of working methods, management of sub-contractors and the motivation of site teams. Additionally he implemented and maintained Quality Standards across all aspects of construction with which he was engaged. In 1994 Paul was promoted to Contracts Manager responsible for a AU$30 million contract to build six new shopping centres in Southern England. At the successful conclusion of that contract Paul migrated to Australia and joined BGC Construction as a Contract Administrator and then as Contract Administration Manager. Subsequently he became the Senior Project Coordinator for WestPoint Construction on three significant projects before joining John Holland Construction as Contract Administrator on the high profile Council House redevelopment. For the five years prior to establishing Mitie Construction Paul was a Director, and the General Manager of Commercial Construction, for Rapley Wilkinson where he was responsible for approximately $20m per annum of construction activity. Stephen is responsible for the operations of the construction teams and the successful delivery of their projects. He engages well at all levels of the construction industry from trades to industry professionals and has experience in maintaining and developing strong client relationships. He has a strong construction background, enabling him to communicate professionally and develop client expectations into successful project outcomes. He is an experienced manager who continually strives for successful project outcomes, who undertakes to develop staff to achieve their full potential and who maintains high expectations on delivering quality throughout all operational tasks. His mandate for the company is to maintain strong financial management, positive programme and time operational outcomes, and maintain high expectations towards developing a Safety, Quality and Environmental Management culture. He remains focused on creating cohesive project teams, well informed and focused on detail and quality outcomes. Stephen is continuing his career in the building industry at management levels, achieved from the beginnings of a solid trade base. The experience gained through this process is viewed by many as an excellent tool in the building management environment. Stephen’s experience has been gained both locally and internationally with experience in New Zealand, England, Scotland and nationally in Queensland, Northern Territory, South Australia and throughout Western Australia covering Northwest, Central and Eastern Wheatbelts, Great Southern and Metropolitan Perth. Stephen also brings to the organisation high levels of experience in Quality, Safety and Environmental systems, having gained qualifications in the areas, and having personally developed systems which achieved certification under AS 4801; AS 14001; ISO 9001 and achieved certification under the Australian Government Building and Construction OHS Accreditation Scheme. Stephen also developed and received the first Australian Accreditation under the Federal Governments Indigenous Opportunities Policy.